The Significance of the "Twelve Tribes of ISRAEL"
What is the "Significance of the Twelve Tribes of Israel…?" What promises did God make to the 12 tribes of Israel? What were His plans and expectations for them? What is the significance of these things today? 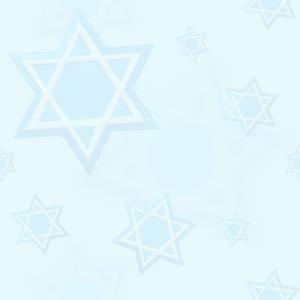 The Bible lists 12 sons of the patriarch Israel who each became the father of a tribe of the ancient nation of Israel. 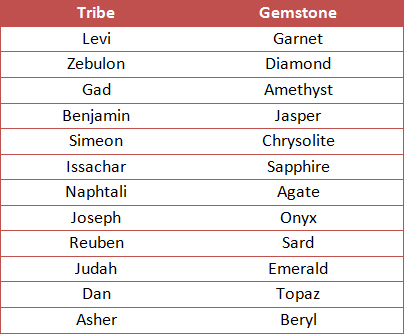 Here is a list of the 12 tribes of Israel from Genesis 49: Reuben; Simeon; Levi (this priestly tribe did not receive a territory, and sometimes is not listed when the tribe of Joseph is listed as two separate tribes); Judah; Zebulun; Issachar; Dan; Gad; Asher; Naphtali; Joseph (often listed as two tribes named for his sons, Ephraim and Manasseh); Benjamin. Let’s look at what the Bible tells us about the history and the future of the 12 tribes of Israel… There were promises made to Abraham, Isaac and Jacob. God promised Abraham that his descendants would be numerous (Genesis 13:16; 17:2; 22:17) and that his descendants would eventually constitute “many nations” (Genesis 17:4-5). He also promised Abraham that his descendants would “possess the gate of their enemies” (Genesis 22:17) and be “blessed” mightily by God (Genesis 22:16-18). God also said that his descendants would be identified throughout history by the name of Abraham’s son, “Isaac” (Genesis 21:12). The blessings given to Abraham and Isaac were called the “birthright” blessings because they were passed on to successive generations as a right of their birth… The “birthright” blessings given to Abraham were passed on to Isaac, who married Rebekah. The blessing of numerous descendants who would possess the gates of their enemies was a continuation of the blessing God had promised Abraham that He would fulfill in Isaac (Genesis 17:17-19, 21). It’s important to note here that… Abraham had a previous son, Ishmael, by Hagar, and Ishmael’s descendants were also prophesied to become numerous and constitute a “great nation” that would feature “twelve princes” (Genesis 17: 20). The “great nation” of Ishmael’s descendants today is the Arab world. But, Ishmael was not God’s promised son to Abraham and from whom the twelve tribes of Israel would come! The 12 tribes of Israel established… Before Jacob (Israel) died, he passed on the “birthright blessings” to his grandsons, who were named Ephraim and Manasseh. Israel gave prophetic blessings that were to be fulfilled in a time called “the latter days” to all 12 of his sons (Genesis 49:1). 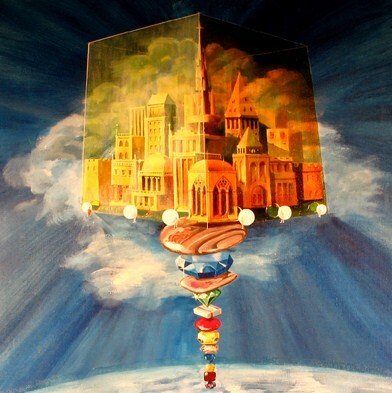 In Genesis 48:16 Israel blessed both Ephraim and Manasseh simultaneously with the words “let my name be named on them, and the name of my fathers Abraham and Isaac; and let them grow into a multitude in the midst of the earth.” Israel decreed that his own name, “Israel”… and the name of his own father, “Isaac,” would be placed upon the descendants of Ephraim and Manasseh, the two sons of Joseph, who were to each become a distinct tribe among Israel’s sons (Genesis 48:5). In doing this, Israel was giving Joseph a “double portion” among the 12 tribes of Israel. Since Joseph was expanded into two tribes, this meant that there would now be 13 tribes of Israel, although they were often still known as “the 12 tribes of Israel” because the priestly tribe, the Levites, did not receive a territorial inheritance in the Promised Land. In the blessings recorded in Genesis 49, Israel gave prophecies for each of the tribes named after his 12 sons. The 12 sons of Israel are Reuben, Simeon, Levi, Judah, Zebulon, Issachar, Dan, Gad, Asher, Naphtali, Joseph and Benjamin. The tribe most recognized today is Judah. “Jews” have long been named after Judah… and is also where “Judea” comes from. Judah began as one individual who grew to become a family and Tribe of Judah, and then the Southern Kingdom, and finally came to represent the entire Jewish religion and nation. When the 12 tribes of Israel entered the Promised Land, they eventually formed the nation of Israel under King David and Solomon. Soon after Solomon’s death, this empire was torn apart by a great civil war. The northern 10 tribes formed the kingdom of Israel, while the southern two tribes, Judah and Benjamin (joined by the priestly tribe of Levi), formed the southern kingdom of Judah. The northern kingdom of Israel was called “Israel” because it was led by the tribes of Ephraim and Manasseh who bore the name of “Israel” (Genesis 48:16). The southern kingdom was led by the tribe of Judah. The northern kingdom of Israel went into captivity in 722 B.C. because of sin and rebellion toward God. Judah was taken into captivity by the Babylonians between 604 and 586 B.C. Just before the fall of Israel, the prophet Amos noted that the northern 10 tribes were known by the name “house of Isaac” (Amos 7:16) just as the prophecies of Genesis 21:12 and 48:16 had predicted. What’s the meaning of their names…? Reuben - means “Seeing.” Born of Leah (Defiled his father’s bed). Simeon - means “Hearing” – 2nd born of Leah. He was left as hostage in Egypt when the brothers went back to Canaan with orders to return with Benjamin. Levi - means “Joined”- 3rd born of Leah. This was the priestly line--only Levites were permitted to be priests and even then they weren't allowed any physical blemishes. Judah - means “Praise” – 4th born of Leah. His was the line that proceeded to the House of David and to Jesus. He acknowledged Tamar (means “Palm”) was more righteous than himself. Genesis 38:26. Dan – means “God is judge” – 1st born of Bilhah. “Dan shall be a serpent by the way, an adder in the path…” Genesis 49:17, also Amos 8:14. Naphtali - means “Wrestling” – 2nd born of Bilhah, a “hind” too…Wrestling was what Jacob did prior to receiving the new name of Israel. It's a word used uniquely in Ephesians 6 - the Armour of God. Issachar - means “Wages” – 5th born of Leah. Joseph - means “The Lord will add a son” – 1st born of Rachel. This Godly man is a figure (type) of Christ, and his coat of many colours was a precept of how Yeshua (Jesus) had His vesture dipped in blood as saviour to all colours and races of men. 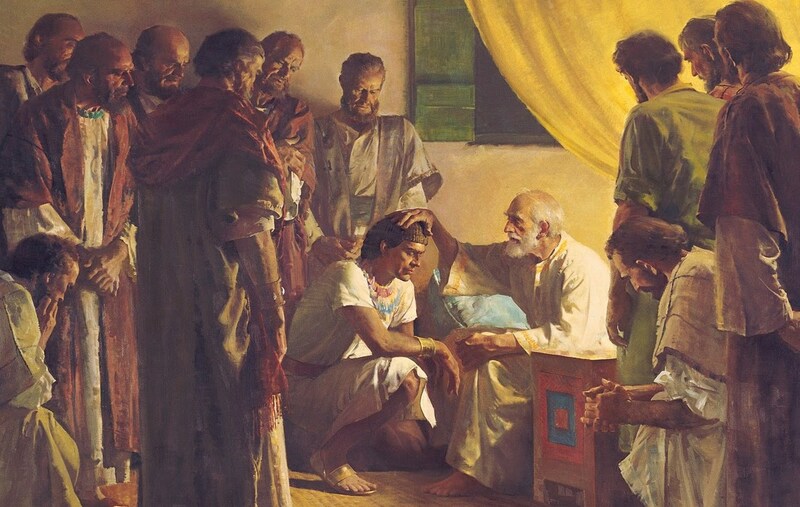 This Joseph was not in the father-son trail to Jesus. Benjamin - means “Son of the right hand” - 2nd born of Rachel. Responsible for dismembering a body into twelve pieces, Judges 19:29. Now the church is described as a body with many members in 1Corinthians 12:13, and we see (Yeshua) Jesus is the REAL son of the right hand. Manasseh - means “To forget my toil and my father's house” - 1st born son of Joseph. This was Gideon's tribe. 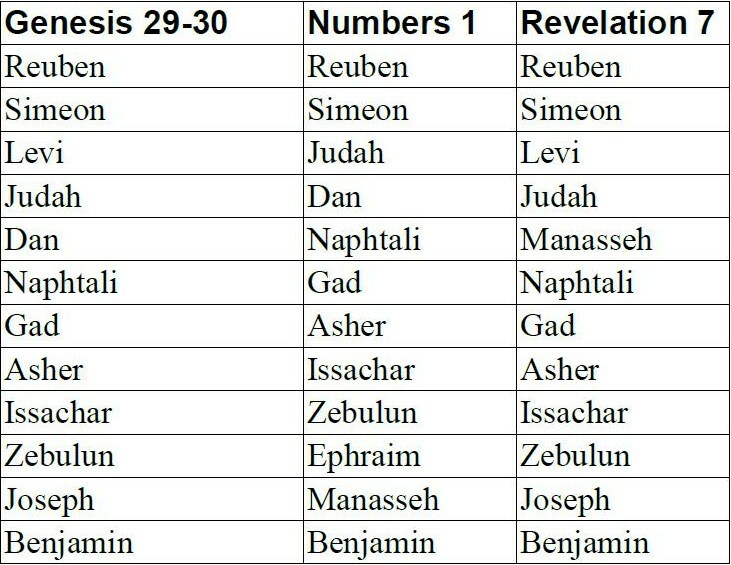 Very Interesting to note… The 7th chapter of the Book of Revelation lists the 12,000 each of the twelve tribes of: Judah, Reuben, Gad, Asher, Naphtali, Manasseh, Simeon, Levi, Issachar, Zabulon, Joseph, Benjamin. Some spelling is different, and note that both Joseph and Manasseh are included, but NOT Dan and Ephraim. Joseph is a fruitful son, a fruitful son by a well, whose branches run over the wall. The archers have sorely grieved him, and shot at him, and an archer lurks for him. 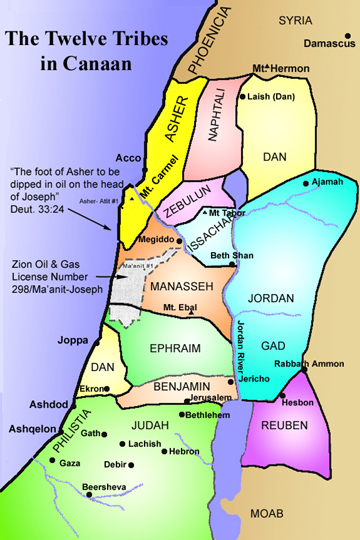 Oil has recently been discovered in Israel based on Bible passages predicting the discovery and its location in the area of Asher, near Haifa. The same Bible (Torah), passages used by Jim Spillman, back in 1981 in his book, "The Great Treasure Hunt." The same passages Zion Oil & Gas Founder John Brown heard Jim teach on a Zion Temple in Michigan thirty years ago and took to heart… Included Jacob’s Blessing, recorded in Genesis 49 and Deuteronomy 33, is the prophecy of a last day’s oil discovery. Chalcedony is one of the stones in the New Jerusalem wall foundations (Revelation 21:15-21). It is milky or greyish in colour and is translucent. Chrysolyte is an orangey yellow in colour stone in the foundations of the New Jerusalem Wall (Rev. 21:15-21). Chrysoprasus is a green agate and is also a New Jerusalem foundation stone (Revelation 21:15-21). Onyx appears in the breastplate and belongs to the Joseph tribe. Its colour is white and black, and sometimes includes brown, and is also a New Jerusalem foundation stone (Revelation 21:15-21). Amber (Ezekiel 1:4, 27; 8:2) – Hard, Translucent brownish yellow sometimes a glowing bronze - Symbol: “the presence and glory of God in Judgement, purification and sanctification. Amethyst (Exodus 28:19, 39:1; Revelations 21:20) – Rich purple to blue-violet of transparent quartz. It is the 9th stone decorating the breastplate - Symbol: “the royal priesthood, kingship and majestic. Pearl (Job 28:18; Matthew 7:6, 13:45&46; I Timothy 2:9; Revelations 17:4, 18:12, 21:21) If an irritant such as a grain of sand becomes trapped within it's shell, the oyster gradually covers it with layers of nacre, which form the precious pearl inside. Symbol: “God's truth, God’s people formed through suffering, endure, and a costly experience. Greek term for pearl: “Margaret” meaning lovely gem. A Remembrance… Like the two sardonyx shoulder stones in the breastplate (Exodus 28:9-10), the Bible states that the purpose of the twelve stones is “to be a perpetual remembrance before the Lord” (Exodus 28:29). 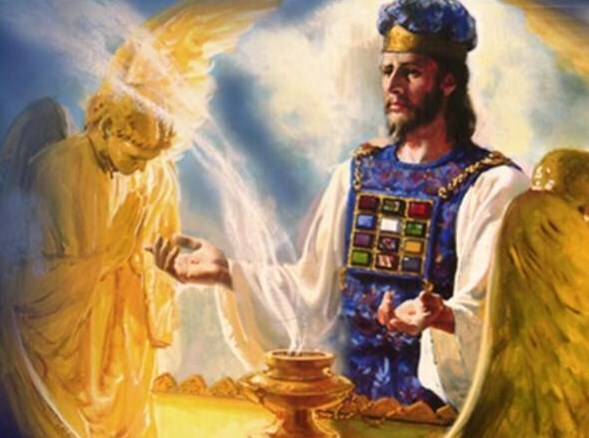 When the High Priest bore the breastplate into the holy place, Israel was remembered for peace. The sages taught that the ephod served to invoke the cause of Israel's sustenance and material welfare… and the breastplate - her salvation, and deliverance from her enemies. There is also a tradition which Moses received at the Sinai revelation, that all 22 letters of the Hebrew alphabet should be present on the stones. Since all of these letters are not found in the names of Jacob's descendants, several other words were also engraved upon the stones: the names of the patriarchs, Abraham Isaac and Jacob, and the words “the tribes of Jeshurun.” One opinion is that the words Abraham, Isaac and Jacob appeared at the top of the first stone, over the name Reuben, and the other words on the last stone. Others maintain that all these extra letters were divided among the stones. Jeshurun in the Bible is a “poetic” name for Israel... and is derived from root word meaning; upright, just, straight. Jeshurun appears four times in the Bible… three times in Deuteronomy and once in Isaiah. It can mean the people of Israel (Deuteronomy 32:15; 33:26), the Land of Israel (Deuteronomy 33:5) …or the Patriarch Jacob - renamed Israel in Genesis 32:29 and Isaiah 44:2.